Wales boss is expecting another physical game in Dublin on Sunday. WALES RUGBY COACH Warren Gatland expects Ireland to continue their forward-oriented approach on Sunday despite Joe Schmidt’s pack being without a number of key members. With Paul O’Connell retired and the likes of Peter O’Mahony, Iain Henderson, Mike Ross and Cian Healy missing through injury, Ireland are without some considerable muscle for their opening game of the campaign. But Gatland expects the home side to approach the clash like they would any other, or more particularly, in the same vein as they did in this fixture two years ago — with an emphasis on territory, the set-piece and the maul. “I suppose the template for them is the way they played against us two years ago when we went to the Aviva Stadium and they played us off the park in terms of driving well at lineout time,” Gatland told Wales Online. “We were well beaten that day. They dominated territory and possession and we didn’t handle their kicking game. “We are expecting the same again from them a little bit because it has been very successful, so we’ve got to make sure we handle that as a team. Gatland was also questioned on his decision to pick two traditional openside flankers, Sam Warburton and Justin Tipuric, in his back row, keeping blindside expert Dan Lydiate in reserve. The Wales boss is confident the balance will be right and believes his selection will give Tipuric a bit more freedom on the field. “With Justin at 7 and Sam at 6, we will play a little bit of left and right. “We are excited by the mix of the back-row which has played well together before. We know what a wonderful rugby player Justin is in terms of playing in those wide channels and hopefully the weather conditions might allow to play a bit of rugby. “The long term forecast doesn’t look brilliant, so that may change our thinking and it may change the way Justin plays the game too. 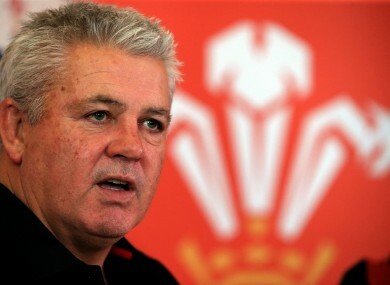 Email “Getting 'strangled' in Dublin two years ago still preying on Gatland's mind”. Feedback on “Getting 'strangled' in Dublin two years ago still preying on Gatland's mind”.